We desire to Glorify God in what we do. We chart our own course and are building the kind of business that we want to live in and be excited about. Much more than just “giving back” – We desire to create an extraordinary relationship with the people of the communities where we work and where we live. We have an intimate workplace. We really do care about each other in the totality of our lives. We pray for each other. We have a structure that is flexible and have the freedom to develop our structure as needed to make wise, knowledgeable and extraordinary commitments to our Partners. We have a passion for the “WHY” of Encompass. We do this because we care about each other. We do this  because we care about our communities. We do this because we are passionate about building relationships with our Partners. Long Term Relationships. We love what we do. We understand the “WHY” of our Partners. We have a passion to make sure that we enhance the “why” of our partner’s business. We are deeply emotional about our business. We are an authentic missional community. With the establishment of our Encompass WHY Foundation, our Team has the opportunity to serve a number of organizations that we hold close to our hearts. High Point is a volunteer driven organization that provides help, hope, spiritual guidance and opportunities for individuals and familes in need. In support of this mission, Encompass Team Members volunteer a night at High Point’s weekly Hot Dog Hover event. 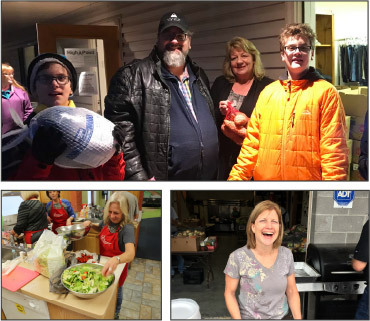 Volunteers help prep, cook, serve meals and engage with hundreds of individuals who are on the edge of poverty and homelessness. It is a night of serving, sharing, and gratitude for all. We are all about making a difference in the communities where we work. Bettering the lives of individuals who make our neighborhoods great. That’s what the Why of Encompass is all about. The purpose of the SHINE Event is to reach out into the workplace community and draw those that might not know about Christ and encourage other Christians in the workplace. The intent is to be the Church outside of the building and in the workplace. We are calling this S.H.I.N.E. For Share, Hope, Inspire, Nourish and Encourage. Our next SHINE will be Thursday, May 9th, check back for more information about our speaker. If you missed the April SHINE, you can still hear our great speaker! Bill is the owner of Element 502, a Louisville based digital marketing agency. He is an expert in communication and teaching businesses and individuals how to tell their stories. Bill believes great storytelling can touch hearts and make a lifelong impact.